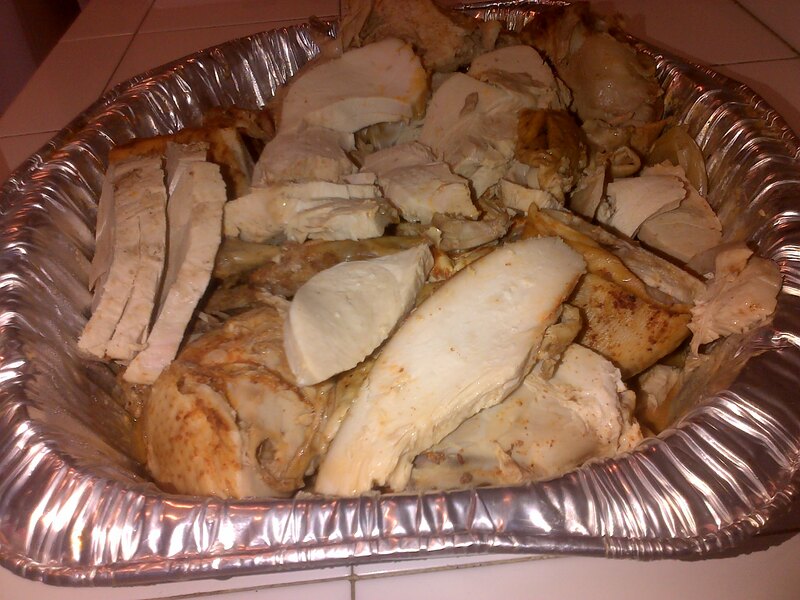 Combine the shredded turkey breast with the stuffing and mix thoroughly. Warm up the 6-8 tortillas at a time in the microwave oven for one minute (They roll up easier when warm). Keep the tortillas warm in a tortilla warmer or in between two dry kitchen towels. Take one tortilla at a time and fill it with a little more than a tablespoon of the turkey/stuffing combination. Roll it up and set aside. If you are having trouble you can hold each taquito together by putting two toothpicks through each. Place them one next to the other on a flat surface. When you have finished rolling all of the taquitos, place canola oil into a frying pan large enough to hold all 8 taquitos. Heat the oil over medium heat for about 3 minutes, and using a pair of tongs, place each taquito into the hot oil, leaning one up against the next. Allow the taquitos to fry for about 5 minutes, or until they become crisp and golden. 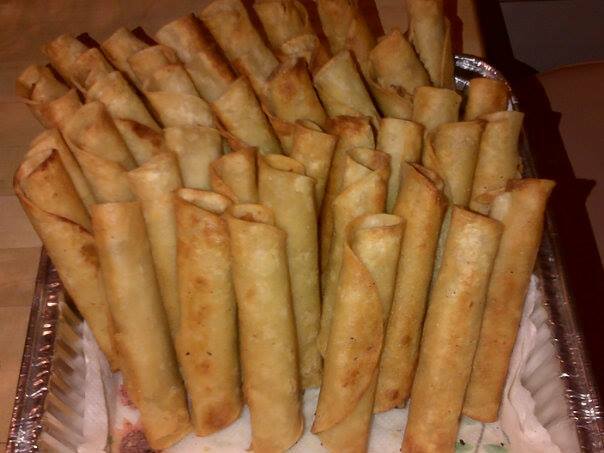 Taquitos will now hold their rolled up shape so that you may remove the toothpicks and turn them over so that they fry for another 5 minutes on the other side. Remove each taquito from the oil and place on a paper towel so that excess oil is absorbed. When you have removed all of the taquitos pat them gently on their top side to absorb that excess oil as well. 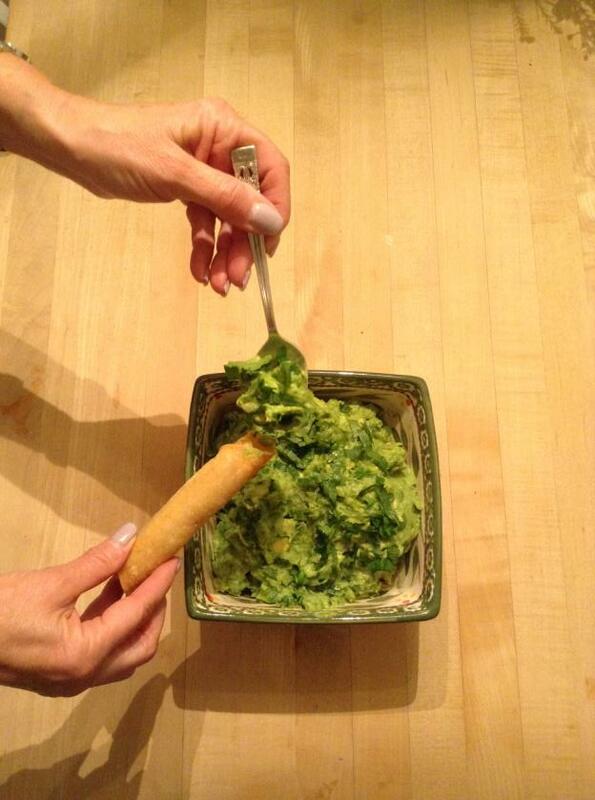 Serve hot and accompany with a homemade guacamole (mashed avocado, diced onion, chopped cilantro and salt to taste). This Thanksgiving I Pay Tribute To My Father And The Music He Taught Me To Love. I started filming my dad in February of this year. I am so grateful to have garnered hour upon hour of conversation. One month after I began filming my dad, just before his 96th birthday, he suffered a stroke, which left him without the ability to speak. I have edited the footage for this particular project, and have made this 14 minute movie to honor, thank and pay tribute to the music my father so loves… the music he ingrained in me. Dad this Thanksgiving 2014, I want to thank you for all that you have given me, but most of all I thank you for the music…it defines me. Since I can remember, early in the morning the music notes stealthily floated away from your living room record player winding their way upstairs. Continuing their path down the hallway, they adeptly made their way beneath the narrow opening at the bottom of my bedroom door. Then with passion and gentle ferocity they wiggled their way into my heart and took hold. In that heart lies the music that framed your life, my dad. There, down deep, Gershwin, Ella and Sinatra, Durante and Martin, Mathis, Bennett, Andy Williams and Eydie Gorme, Agustin Lara, Los Panchos, Edith Piaf and Doris Day, The Three Tenors, Vladimir Horowitz , Oistrakh, Dvorak and on and on… safely reside to this day. Now, at 96, though your speech is diminished, your eyes speak the words you can no longer utter. The music still connects us in that elemental way it always did. In those blue-green eyes lies the man you’ve always been. Dad this year on this Thanksgiving I want to express that I am so grateful for all that you’ve given me, but especially for the music that has so enriched my life, and for every instant we still spend together. Happy Thanksgiving 2014 to all! 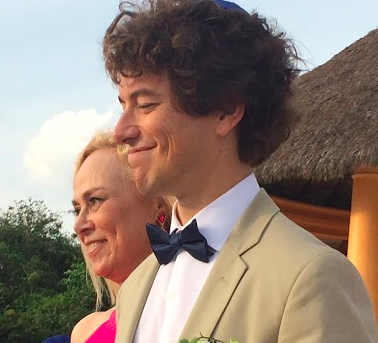 Mazel Tov Michael and Kat! That was how I started out my speech last Friday night at my nephew’s wedding in Careyes, Mexico. 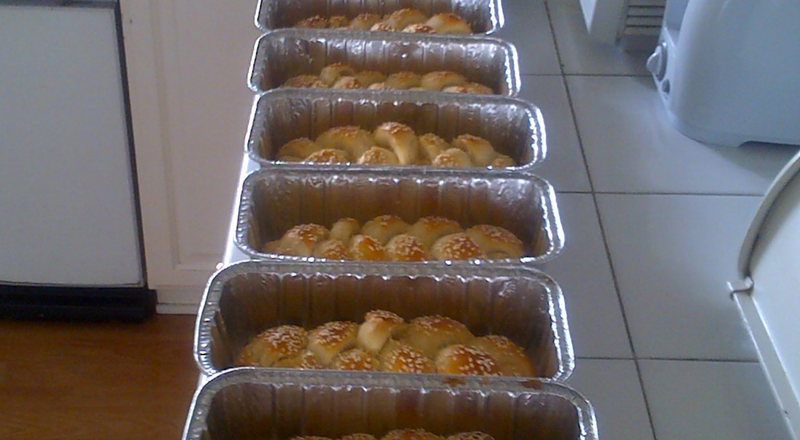 I had spent the previous 2 days making and baking 34 challahs for the Shabbat dinner we would be having on the beach the Friday before the wedding. In customs after landing in Puerto Vallarta, a very astute and beautiful Black Labrador was relentlessly trying to get into my suitcase where I had packed the 34 challahs for the 17 tables there would be at the dinner that night. The customs agent firmly holding the lab back on his leash politely asked me, “Señora, do you have food on you?” “Yes I do” I said. “What is it?” he asked, I responded simply, “Baked bread.” He said, “We are going to have to inspect it.” A young lady agent and I walked over to a table where we lifted up the suitcase. I didn’t unzip it all the way fearing she would have to go through each loaf, so I opened it just enough for her to catch a quick glimpse as I pulled out one of the loaves in its aluminum foil container. I showed it to her and she asked me if it contained any meat, to which I responded “Para nada,” absolutely not. She asked, “what are the ingredients?” “Sugar, yeast, water, eggs, oil, salt and flour”. She said “O.K. go ahead,” and I quickly zipped up the suitcase and made my way to the exit! 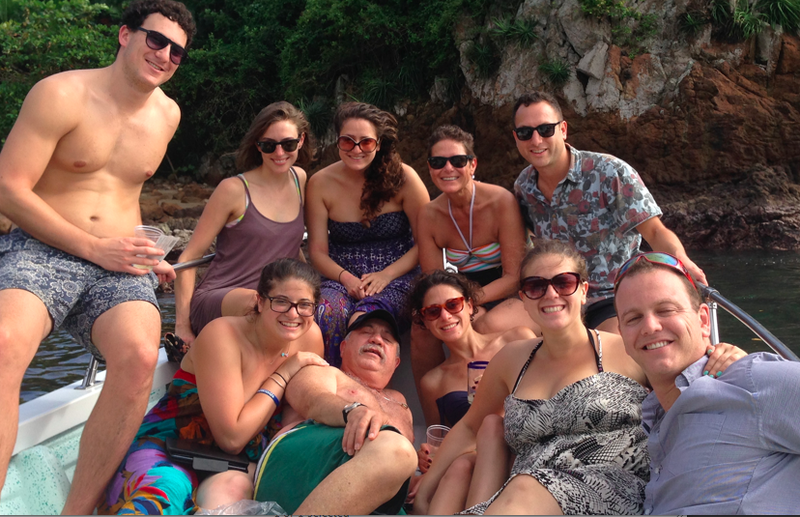 About 3 hours later and a bit car sick, the 10 of us arrived at the casitas (houses) at Costa Careyes. We delivered the challahs to Michael, my nephew, went quickly to get changed, and then went down to Shabbat dinner on the beach at Playa Rosa. I kissed Michael and Kat (his fiancée) and my cousins Mark, Leah, Claudia, Fernando and Jenni. Then there were my cousins’ precious children Dan, Orly, Gabriel and Diego. 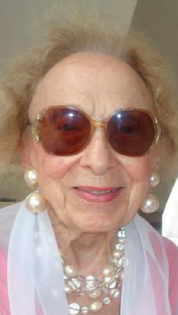 I hugged and held my cherished Aunt Fressia closely. 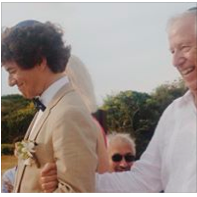 To be there with my husband and all of our children, and to greet family and friends from near and far on that beach was beautiful, and sharing in the experience of that Shabbat dinner was such a special and meaningful way to kick off the weekend with FAMILY. We were all quite worried about Grandma Helen, Michael’s 99 year-old grandmother who had wanted to be there for her only grandchild’s wedding. Helen had never been out of the U.S. and had applied for a passport for the first time in her life just a few months before. She had gotten very sick and dehydrated on the ride from the airport, but thankfully began to feel better upon her arrival at the venue. The next day we were free to hang out at the beach. In the middle of the day, Ariela, our daughter, said “Mom, we have a surprise for you and Dad in a few minutes.” I asked if we should go up and change, but she said “No”. Ten minutes later a boat pulled up to the edge of the beach and our kids said, “Here is your surprise, let’s go, let’s get on the boat!” “OK Captain Crunchy (that’s what the boat captain called himself) Let’s go.” All ten of us on board, we took off for the next beach cove over, Playa Blanca. This was the spot where I had met my husband 38 years earlier. In the ocean, in front of the sands of Playa Blanca, our kids pulled out a bucket with a bottle of champagne. They opened the bottle and poured champagne for all of us. 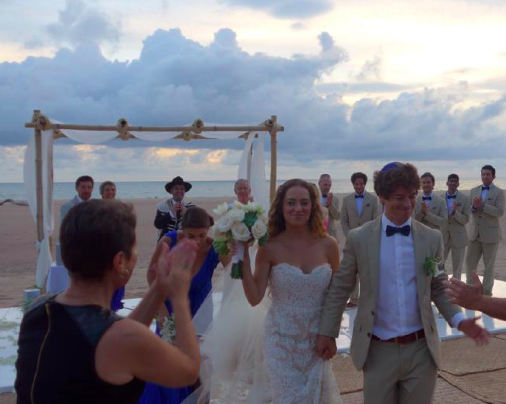 They made toasts to us and said, “Dad, tell us about the first time you met Mom.” My husband, Isaac, proceeded to tell them the story, and I followed with my version of that fateful day we first met at Playa Blanca in Mexico, all those years ago. There it was again that special and magic moment shared with FAMILY. While the family still slept on the morning of the wedding I tiptoed out the front door. I hadn’t gotten the chance to meet my cousin Jenni’s baby, Danielle, so I went on a mission to find their villa (which was not easy). I descended stairs, crossed a beach, ascended stairs and boarded a funicular in their search. I finally found their place and I met beautiful little Danielle; my heart melted as I looked at my cousin’s beautiful little blue-eyed baby daughter. Upon my return, Juana our cook/housekeeper was already in the midst of preparing a typical Mexican breakfast of huevos revueltos a la Mexicana, scrambled eggs Mexican style served with warm corn tortillas, guacamole, and salsa, accompanied by wonderful hot Mexican coffee. One at a time, the delicious aroma beckoned sleepy person after sleepy person to the table. We all wiped our dishes clean and went off to get ready for the wedding. 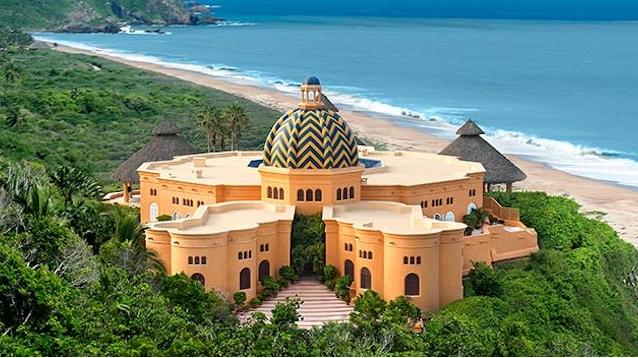 Shuttles would be taking groups to the wedding venue, Cuixmala, which was a 20 minute ride away. We were on the 1:30 Shuttle. 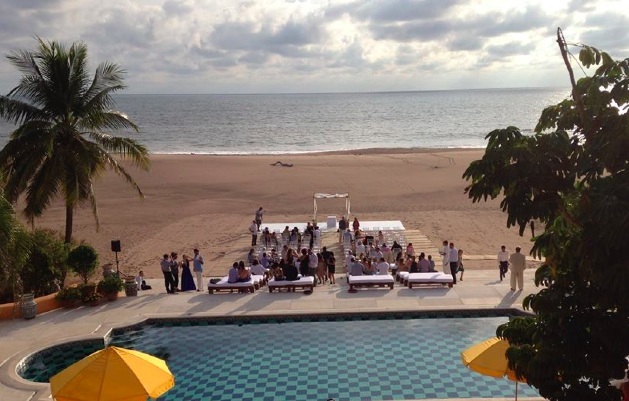 We really didn’t know what to expect, but when we arrived at Casa Cuixmala, our jaws dropped and we understood why this was Michael and Kat’s dream wedding venue . The interior of this palace was just as spectacular as the exterior. We were offered drinks and hors d’oeuvres while a talented Mexican trio played so many of my favorite romantic Mexican songs (boleros, to which I know all of the lyrics). I was bursting with joy to be here in this dream setting with my immediate and extended family to celebrate the wedding of my very special nephew. After photos we were told to make our way down to the beach, so we descended the many many stairs, and there beyond the pool stood the beautiful and perfect chuppah, right on the beach. The moment came, the procession began. Grandma Helen fully recovered, was sitting front row center. Out walked the Rabbi, followed by Michael, the groom, looking happy and serene, flanked by my beaming brother Gary and beautiful sister-in-law Michele. 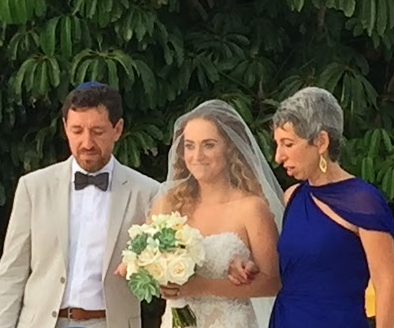 Then came the best man (my son Aaron) and maid of honor followed by the rest of the bridal party, culminating with the gorgeous bride, Katerina and her proud parents, Faina and Michael. The groom stepped forward, took his bride-to-be, and together they walked toward the marriage canopy. 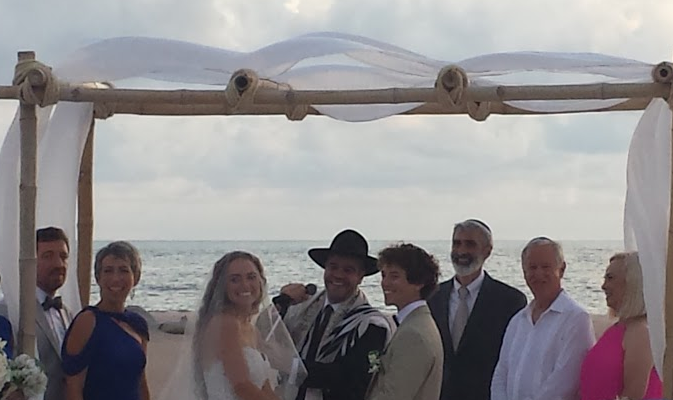 The Rabbi chanted and spoke, blessings were bestowed, vows were made, Michael broke the glass, and there at a most perfect time and place, on that Mexican beach, my dear nephew Michael married his beloved Kat. We formed a cocoon of love and we held Michael and Kat warmly within. The magic of that moment surrounded by cherished FAMILY and friends from near and far, will remain etched within each and every heart of those of us who were fortunate to be there to share in that real life fairy tale. P.S. Part 2 coming soon: The party and 34 Challah recipe.